The 2013 Los Angeles Dodgers season was the Dodgers' 124th for the franchise in Major League Baseball, and their 56th season in Los Angeles. The Dodgers dealt with a series of injuries to key players during the first half of the season and on June 21 were 31-42, 9 1/2 games back in last place in the NL West. Beginning with a 6-1 win over the San Diego Padres on June 22, the return of the injured players, and the emergence of rookie Yasiel Puig, they went 46-10 through August 23 as the rest of the division collapsed. On September 19, they clinched the Western Division title. This was the earliest the Dodgers had ever clinched a title and the largest deficit they had ever overcome to win the division. They opened the playoffs by defeating the Atlanta Braves in the Division Series and advanced to the NL Championship Series. In the NLCS, they lost to the St. Louis Cardinals in six games. The Dodgers returned home on September 9 and smacked the Arizona Diamondbacks 8-1. Juan Uribe went had 4 hits, including 3 home runs, in 4 at-bats. He was the first Dodger to hit three homers in a game since Andre Ethier on June 26, 2009. The Dodgers as a team hit six homers in the game, the most since they hit seven against the Padres on September 16, 2006. The team won again the next night, as Scott Van Slyke hit a pinch hit walk-off home run in the 11th inning to give the Dodgers a 5-3 win. This was the team's first walk off homer by a pinch hitter since Olmedo Sáenz in 2007. Patrick Corbin kept the Dodgers offense in check the next day and the Diamondbacks won 4-1. A walk-off single by Adrian Gonzalez in the 10th inning gave the Dodgers a 3-2 win over the San Francisco Giants on September 12. Madison Bumgarner out pitched Kershaw as the Giants won the next game, 4-2. The Giants pounded the Dodgers 19-3 on September 15. The 19 runs was the most ever scored by one team at Dodger Stadium, the most allowed by the Dodgers in a game since May 5, 2001, at Chicago, and the worst Dodger home defeat since a July 3, 1947 loss to the Giants in Brooklyn. Hunter Pence hit two homers in the Giants 4-3 win in the series finale. He hit five homeruns in total in the four game series, the first Giant to accomplish that feat against the Dodgers since Willie Mays. As National League West Champions, the Dodgers advanced to the 2013 NLDS to play the Eastern Division champion Atlanta Braves. They suffered a blow on the last day of the regular season when MRI results revealed that Matt Kemp had a severe ankle injury and would not be able to play in the post-season. Andre Ethier was also dealing with an ankle injury and he was limited to pinch hitting in the division series. The Dodgers selected 40 players in this draft. Of those, only one of them, pitcher José De León, has played Major League Baseball as of the 2016 season. The first round draft pick was right-handed pitcher Chris Anderson from Jacksonville University. ↑ "Dave Hansen out as hitting coach". espn.com. October 13, 2012. ↑ Gurnick, Ken (November 7, 2012). 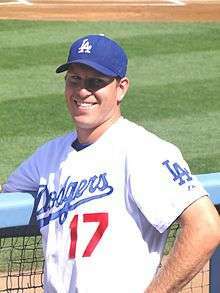 "Big Mac gives LA marquee name as hitting coach". Losangeles.dodgers.mlb.com. ↑ "Dodgers Announce 2013 Coaching Staff". Losangeles.dodgers.mlb.com. November 13, 2012. ↑ Stephen, Eric (October 29, 2012). "Seven Dodgers become free agents". truebluela.com. ↑ Gurnick, Ken (October 29, 2012). "Dodgers decline 2013 contract options for trio". Losangeles.dodgers.mlb.com. ↑ Gurnick, Ken (October 30, 2012). "Dodgers ink closer League to three-year deal". Losangeles.dodgers.mlb.com. ↑ Gurnick, Ken (December 9, 2012). "Dodgers reach agreement with starter Ryu". Losangeles.dodgers.mlb.com. Retrieved December 9, 2012. ↑ Gurnick, Ken (December 10, 2012). "Greinke's six-year deal with Dodgers finalized". Losangeles.dodgers.mlb.com. Retrieved December 10, 2012. ↑ Gurnick, Ken (January 7, 2013). "Dodgers, reliever Howell finalize one-year deal". Losangeles.dodgers.mlb.com. Retrieved January 8, 2013. ↑ Hernandez, Dylan (December 12, 2012). "Dodgers finalize deal for Skip Schumaker". LATimes.com. Retrieved December 12, 2012. ↑ Harding, Thomas (December 19, 2012). "Dodgers deal Ely to Astros for Rasmussen". mlb.com. Retrieved December 20, 2012. ↑ Gurnick, Ken (February 12, 2013). "Dodgers ready to get first look at Greinke, Ryu". dodgers.com. ↑ Gurnick, Ken (March 21, 2013). "Needing surgery, Hanley out for two months". dodgers.com. ↑ "Dodgers option Gordon, hot-hitting Puig to Minors". mlb.com. March 26, 2013. ↑ Gurnick, Ken (April 1, 2013). "Kershaw dazzles with shutout, homer vs. Giants". Losangeles.dodgers.mlb.com. ↑ Gurnick, Ken (April 3, 2013). "Ryu solid in debut, but Dodgers shut out". Losangeles.dodgers.mlb.com. ↑ Gurnick, Ken (April 3, 2013). "Dodgers squander chances, drop opening series". Losangeles.dodgers.mlb.com. ↑ Gurnick, Ken (April 6, 2013). "Greinke opens Dodgers career with a gem". Losangeles.dodgers.mlb.com. ↑ Laymance, Austin (April 7, 2013). "Kershaw to 2-0 as Dodgers shut out Pirates". Losangeles.dodgers.mlb.com. ↑ Laymance, Austin (April 8, 2013). "Gonzo fuels Dodgers' attack in sweep of Bucs". Losangeles.dodgers.mlb.com. ↑ Gurnick, Ken (April 9, 2013). "Plenty of blame to go around after loss to Padres". Losangeles.dodgers.mlb.com. ↑ Gurnick, Ken (April 11, 2013). "Dodgers' blasts back sharp Billingsley in return". Losangeles.dodgers.mlb.com. ↑ Gurnick, Ken (April 12, 2013). "LA irate after melee in win leaves Greinke hurt". Losangeles.dodgers.mlb.com. ↑ Gurnick, Ken (April 13, 2013). "Dodgers unable to back Kershaw vs. D-backs". Losangeles.dodgers.mlb.com. ↑ Gurnick, Ken (April 14, 2013). "Ryu delivers solid start, three hits in win over D-backs". Losangeles.dodgers.mlb.com. ↑ Gurnick, Ken (April 14, 2013). "Beckett's superb start ends in heartbreak in ninth". Losangeles.dodgers.mlb.com. ↑ Gurnick, Ken (April 16, 2013). "Bullpen's wild inning costly on Jackie Robinson Night". Losangeles.dodgers.mlb.com. ↑ Laymance, Austin (April 17, 2013). "Depleted Dodgers drop third straight". Losangeles.dodgers.mlb.com. ↑ Laymance, Austin (April 18, 2013). "Kershaw stumbles as LA's skid reaches four". Losangeles.dodgers.mlb.com. ↑ Gurnick, Ken (April 20, 2013). "Bullpen struggles late in Dodgers' loss to Birds". Losangeles.dodgers.mlb.com. ↑ Gurnick, Ken (April 20, 2013). "Slide continues in second leg of doubleheader vs. O's". Losangeles.dodgers.mlb.com. ↑ Gurnick, Ken (April 21, 2013). "Billingsley heads to DL, Fife recalled for Sunday start". Losangeles.dodgers.mlb.com. ↑ Gurnick, Ken (April 21, 2013). "Kemp, M. Ellis power Dodgers past Orioles". Losangeles.dodgers.mlb.com. ↑ Gurnick, Ken (April 24, 2013). "M. Ellis carries Dodgers to victory with two homers". Losangeles.dodgers.mlb.com. ↑ Gurnick, Ken (April 25, 2013). "One out from win, Dodgers lose in walk-off fashion". Losangeles.dodgers.mlb.com. ↑ Gurnick, Ken (April 25, 2013). "Ryu outstanding as LA takes two of three in New York". Losangeles.dodgers.mlb.com. ↑ Laymance, Austin (April 27, 2013). "Gonzalez's double leads Dodgers to victory". Losangeles.dodgers.mlb.com. ↑ Laymance, Austin (April 28, 2013). "Dodgers unable to reward Magill in stellar debut". Losangeles.dodgers.mlb.com. ↑ Laymance, Austin (April 28, 2013). "Crawford homers twice as Kershaw cruises". Losangeles.dodgers.mlb.com. ↑ Gurnick, Ken (April 30, 2013). "Lilly hurting after Dodgers drubbed by Rockies". Losangeles.dodgers.mlb.com. ↑ Gurnick, Ken (May 1, 2013). "Hanley provides homer to back electric Ryu". Losangeles.dodgers.mlb.com. ↑ Laymance, Austin (May 2, 2013). "Beckett still winless as Dodgers fall". Losangeles.dodgers.mlb.com. ↑ Gurnick, Ken (May 4, 2013). "Hurting Dodgers lose on Giants' walk-off homer". Losangeles.dodgers.mlb.com. ↑ Gurnick, Ken (May 5, 2013). "Dodgers endure another walk-off defeat". Losangeles.dodgers.mlb.com. ↑ Gurnick, Ken (May 6, 2013). "Dodgers nearly come back before falling to SF". Losangeles.dodgers.mlb.com. ↑ Gurnick, Ken (May 7, 2013). "Misplays loom large in Dodgers' fifth straight loss". Losangeles.dodgers.mlb.com. ↑ Gurnick, Ken (May 8, 2013). "League can't put closure on Dodgers' skid". Losangeles.dodgers.mlb.com. ↑ Laymance, Austin (May 9, 2013). "Slide hits seven as LA can't slow Goldschmidt". Losangeles.dodgers.mlb.com. ↑ Laymance, Austin (May 11, 2013). "Dodgers fall to Marlins despite promising start". Losangeles.dodgers.mlb.com. ↑ Laymance, Austin (May 12, 2013). "Dodgers snap losing streak behind Ryu". Losangeles.dodgers.mlb.com. ↑ Laymance, Austin (May 12, 2013). "Dodgers deliver Capuano's first win, take series". Losangeles.dodgers.mlb.com. ↑ Gurnick, Ken (May 14, 2013). "Beckett injured, has short night vs. Nationals". Losangeles.dodgers.mlb.com. ↑ Gurnick, Ken (May 15, 2013). "Kershaw fans 11 in dominating win over Nats". Losangeles.dodgers.mlb.com. ↑ Laymance, Austin (May 16, 2013). "Greinke's return provides spark against Nationals". Losangeles.dodgers.mlb.com. ↑ Gurnick, Ken (May 18, 2013). "Bullpen, defense bother Mattingly in series opener". Losangeles.dodgers.mlb.com. ↑ Gurnick, Ken (May 18, 2013). 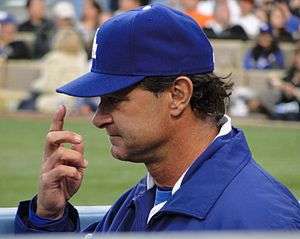 "Latest loss has Mattingly searching for answers". Losangeles.dodgers.mlb.com. ↑ Gurnick, Ken (May 19, 2013). "Bullpen takes third loss in three days against Atlanta". Losangeles.dodgers.mlb.com. ↑ Gurnick, Ken (May 21, 2013). "Ethier, Kemp go deep to back Kershaw's gem". Losangeles.dodgers.mlb.com. ↑ Gurnick, Ken (May 22, 2013). "Greinke unable to find form, bested by former mates". Losangeles.dodgers.mlb.com. ↑ Gurnick, Ken (May 22, 2013). "Dodgers fortify Ryu in finale win over Brewers". Losangeles.dodgers.mlb.com. ↑ Shaikin, Bill (May 23, 2013). "Has Don Mattingly fired himself with his recent comments?". latimes.com. ↑ Laymance, Austin (May 25, 2013). "Capuano allows five earned runs in loss". Losangeles.dodgers.mlb.com. ↑ Laymance, Austin (May 26, 2013). "Gonzalez homers, drives in three in win over Cards". Losangeles.dodgers.mlb.com. ↑ Gurnick, Ken (May 26, 2013). "Kershaw allows four runs in loss to Cardinals". Losangeles.dodgers.mlb.com. ↑ Gurnick, Ken (May 28, 2013). "Adrian 4-for-4 as Dodgers derail Angels". Losangeles.dodgers.mlb.com. ↑ Gurnick, Ken (May 29, 2013). "Dodgers roll Angels behind Ryu's two-hitter". Losangeles.dodgers.mlb.com. ↑ Laymance, Austin (May 30, 2013). "Injury to Kemp compounds loss for Dodgers". Losangeles.dodgers.mlb.com. ↑ Laymance, Austin (May 31, 2013). "Ball doesn't bounce Dodgers' way in loss". Losangeles.dodgers.mlb.com. ↑ Gurnick, Ken (June 1, 2013). "Dodgers feel good with win despite closer question". Losangeles.dodgers.mlb.com. ↑ Gurnick, Ken (June 1, 2013). "Little goes right for Dodgers in 10th-inning loss". Losangeles.dodgers.mlb.com. ↑ Gurnick, Ken (June 2, 2013). "Magill's six in spot start not enough for ailing Dodgers". Losangeles.dodgers.mlb.com. ↑ Laymance, Austin (June 4, 2013). "Pair of homers plus Puig's defense lift Dodgers". Losangeles.dodgers.mlb.com. ↑ Gurnick, Ken (June 5, 2013). "Puig's second game is better than his first". Losangeles.dodgers.mlb.com. ↑ Gurnick, Ken (June 6, 2013). "Puig shown how other half live as Dodgers fall". Losangeles.dodgers.mlb.com. ↑ Laymance, Austin (June 7, 2013). "Puig punctuates Greinke's gem with first slam". Losangeles.dodgers.mlb.com. ↑ Gurnick, Ken (June 8, 2013). "Puig's homer sets stage for wild walk-off in LA". Losangeles.dodgers.mlb.com. ↑ Gurnick, Ken (June 9, 2013). "Rookies shine, but Dodgers fall to Braves". Losangeles.dodgers.mlb.com. ↑ Laymance, Austin (June 9, 2013). "Missing key pieces, Dodgers succumb to Braves". Losangeles.dodgers.mlb.com. ↑ Gurnick, Ken (June 11, 2013). "Ninth-inning rally by D-backs sinks Dodgers". Losangeles.dodgers.mlb.com. ↑ Gurnick, Ken (June 12, 2013). "Federowicz lands late haymaker in brawl-filled game". Losangeles.dodgers.mlb.com. ↑ Gurnick, Ken (June 13, 2013). "Spirited effort in 12th inning comes up short". Losangeles.dodgers.mlb.com. ↑ Schlegel, John (June 14, 2013). "Discipline issued to D-backs, Dodgers". mlb.com. ↑ Petrella, Steven (June 14, 2013). "Fife's solid outing goes unrewarded in Pittsburgh". Losangeles.dodgers.mlb.com. ↑ Petrella, Steven (June 15, 2013). "Pair of RBI knocks in 11th lift Dodgers to win". Losangeles.dodgers.mlb.com. ↑ Petrella, Steven (June 16, 2013). "Greinke off as Dodgers drop rubber game to Bucs". Losangeles.dodgers.mlb.com. ↑ Gurnick, Ken (June 18, 2013). "Opener in Bronx a wash; twin bill on Wednesday". Losangeles.dodgers.mlb.com. ↑ Gurnick, Ken (June 19, 2013). "Errors mar Mattingly's first game vs. Yanks". Losangeles.dodgers.mlb.com. ↑ Gurnick, Ken (June 19, 2013). "Hanley, Puig carry Dodgers to Bronx split". Losangeles.dodgers.mlb.com. ↑ Gurnick, Ken (June 21, 2013). "Puig homers again but Dodgers come up short". Losangeles.dodgers.mlb.com. ↑ Gurnick, Ken (June 22, 2013). "Kershaw unable to solve Padres' riddle". Losangeles.dodgers.mlb.com. ↑ Gurnick, Ken (June 22, 2013). "Greinke takes care of business, stifles Padres". Losangeles.dodgers.mlb.com. ↑ Gurnick, Ken (June 23, 2013). "Late homers earn split behind short-rested Capuano". Losangeles.dodgers.mlb.com. ↑ Laymance, Austin (June 24, 2013). "Puig the hero in first rivalry game vs. Giants". Losangeles.dodgers.mlb.com. ↑ Gurnick, Ken (June 26, 2013). "Dodgers edge Giants for four-game win streak". Losangeles.dodgers.mlb.com. ↑ Gurnick, Ken (June 27, 2013). "Dodgers back Kershaw to finish sweep of Giants". Losangeles.dodgers.mlb.com. ↑ Gurnick, Ken (June 28, 2013). "In a Puig of his own, Yasiel does it again". Losangeles.dodgers.mlb.com. ↑ Gurnick, Ken (June 29, 2013). "Dodgers' win streak comes to historic end". Losangeles.dodgers.mlb.com. ↑ Laymance, Austin (June 30, 2013). "Dodgers recover in wild ninth for walk-off win". Losangeles.dodgers.mlb.com. ↑ Laymance, Austin (June 30, 2013). "Puig's record day helps Dodgers cruise by Phils". Losangeles.dodgers.mlb.com. ↑ Gurnick, Ken (July 2, 2013). "Dominant Kershaw shuts out Rockies". Losangeles.dodgers.mlb.com. ↑ Gurnick, Ken (July 3, 2013). "Bats overcome Greinke's rocky start to sink Rox". Losangeles.dodgers.mlb.com. ↑ Gurnick, Ken (July 5, 2013). "Dodgers focused on big picture after finale loss". Losangeles.dodgers.mlb.com. ↑ Gurnick, Ken (July 6, 2013). "Uribe racks up seven RBIs to lead Dodgers". Losangeles.dodgers.mlb.com. ↑ Gurnick, Ken (July 7, 2013). "Errors help shorten Fife's outing in loss to Giants". Losangeles.dodgers.mlb.com. ↑ Gurnick, Ken (July 7, 2013). "A.J. Ellis, Kershaw combine to top Giants". Losangeles.dodgers.mlb.com. ↑ Gurnick, Ken (July 9, 2013). "Stellar Greinke shuts down D-backs in opener". Losangeles.dodgers.mlb.com. ↑ Gurnick, Ken (July 10, 2013). 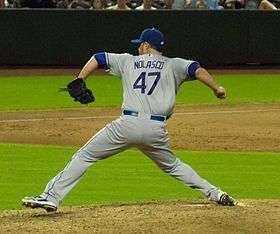 "Nolasco delivers in Dodgers debut". Losangeles.dodgers.mlb.com. ↑ Gurnick, Ken (July 11, 2013). "Dodgers go back-to-back in 14th to sweep D-backs". Losangeles.dodgers.mlb.com. ↑ Laymance, Austin (July 12, 2013). 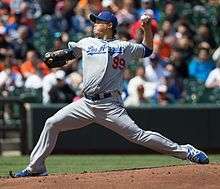 "Capuano's gem leads LA to fifth straight win". Losangeles.dodgers.mlb.com. ↑ Laymance, Austin (July 13, 2013). "Dodgers lose win streak, Puig in shutout to Rockies". Losangeles.dodgers.mlb.com. ↑ Laymance, Austin (July 13, 2013). 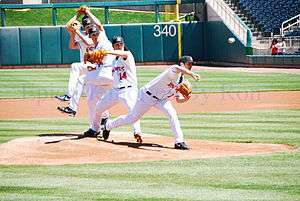 "Greinke dominates Rox with fourth career shutout". Losangeles.dodgers.mlb.com. ↑ Laymance, Austin (July 14, 2013). "Nolasco comes up short in home debut vs. Rox". Losangeles.dodgers.mlb.com. ↑ Gonzalez, Alden (July 17, 2013). "Kershaw turns in perfect All-Star third inning". Losangeles.dodgers.mlb.com. ↑ Simon, Andrew (July 20, 2013). "Ethier homer in ninth lifts Dodgers back over .500". Losangeles.dodgers.mlb.com. ↑ Simon, Andrew (July 21, 2013). "Hanley delivers in 10th as Dodgers close in on first". Losangeles.dodgers.mlb.com. ↑ Simon, Andrew (July 21, 2013). "Kemp, Dodgers drub Nats, get taste of first place". Losangeles.dodgers.mlb.com. ↑ Gurnick, Ken (July 23, 2013). "A.J. 's letter-perfect game leads Dodgers into first place". Losangeles.dodgers.mlb.com. ↑ Gurnick, Ken (July 24, 2013). "Adrian's big blast pushes Dodgers' rally over top". Losangeles.dodgers.mlb.com. ↑ Gurnick, Ken (July 24, 2013). "Dodgers push win streak to six with five-run 10th". Losangeles.dodgers.mlb.com. ↑ Stephen, Eric (July 24, 2013). "Dodgers 8, Blue Jays 3: 10 innings for 10th straight road win". truebluela.com. ↑ Laymance, Austin (July 26, 2013). "Greinke's bid for 100th win spoiled by Latos, Reds' bats". mlb.com. ↑ Laymance, Austin (July 27, 2013). "Hanley's homer backs Kershaw's gem". mlb.com. ↑ Laymance, Austin (July 28, 2013). "Ryu silences Reds over seven brilliant innings". mlb.com. ↑ Laymance, Austin (July 28, 2013). "Puig's walk-off blast ends scoreless tie in 11th". mlb.com. ↑ Gurnick, Ken (July 30, 2013). "M. Ellis' walk-off hit keeps Dodgers rolling". mlb.com. ↑ Gurnick, Ken (August 1, 2013). "Dodgers derailed despite Kershaw's gem". mlb.com. ↑ Gurnick, Ken (August 2, 2013). "Hairston, Hanley lead determined LA squad over Cubs". mlb.com. ↑ Gurnick, Ken (August 2, 2013). "LA ties franchise record with 12th straight road win". mlb.com. ↑ Gurnick, Ken (August 3, 2013). "LA sets franchise record with 13 straight road wins". mlb.com. ↑ Gurnick, Ken (August 4, 2013). "LA extends road streak, but loses Hanley". mlb.com. ↑ Thornburg, Chad (August 5, 2013). "Greinke wins duel with bat, arm to extend road streak". mlb.com. ↑ Thornburg, Chad (August 7, 2013). "Bats can't aid Kershaw as road win streak ends at 15". mlb.com. ↑ Thornburg, Chad (August 8, 2013). "Dodgers plate six runs in second, blow out Cardinals". mlb.com. ↑ Thornburg, Chad (August 9, 2013). "Dodgers complete road trip with a series win". mlb.com. ↑ Gurnick, Ken (August 10, 2013). "Four-run ninth lifts Dodgers to walk-off win". mlb.com. ↑ Laymance, Austin (August 10, 2013). "Greinke leads way in shutout of Rays". mlb.com. ↑ Gurnick, Ken (August 12, 2013). "Kershaw's gem carries Dodgers to sweep of Rays". mlb.com. ↑ Laymance, Austin (August 13, 2013). "Red-hot Dodgers notch sixth straight win in opener". mlb.com. ↑ Laymance, Austin (August 14, 2013). "Ryu bests Harvey as LA wins seventh straight". mlb.com. ↑ Laymance, Austin (August 15, 2013). "Puig, Adrian double up in 12th to sweep Mets". mlb.com. ↑ Gurnick, Ken (August 16, 2013). "Greinke, Hanley spur Dodgers to ninth straight win". mlb.com. ↑ Gurnick, Ken (August 17, 2013). "Kershaw's gem extends Dodgers' streak of dominance". mlb.com. ↑ Gurnick, Ken (August 18, 2013). 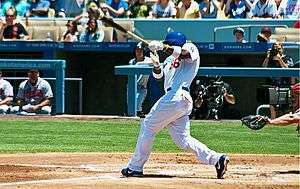 "Hanley's miscues sting Dodgers as streak ends". mlb.com. ↑ Gurnick, Ken (August 20, 2013). "Ryu solid, but Dodgers drop second straight game". mlb.com. ↑ Gurnick, Ken (August 21, 2013). "Puig homers off bench to deliver win for LA". mlb.com. ↑ Gurnick, Ken (August 21, 2013). "Greinke dazzles in Miami for latest Dodgers gem". mlb.com. ↑ Gurnick, Ken (August 22, 2013). "Kershaw stymies Marlins with eight-inning gem". mlb.com. ↑ Laymance, Austin (August 24, 2013). "Dodgers' Nolasco shuts down Red Sox". mlb.com. ↑ Laymance, Austin (August 24, 2013). "Dodgers can't overcome Ryu's first-inning struggles". mlb.com. ↑ Gurnick, Ken (August 26, 2013). "Dodgers stifled by Peavy, drop first series since June". mlb.com. ↑ Gurnick, Ken (August 27, 2013). "Greinke tops Cubs, falling just shy of shutout". mlb.com. ↑ Gurnick, Ken (August 28, 2013). "Offense keeps quiet as Kershaw's win streak ends". mlb.com. ↑ Laymance, Austin (August 28, 2013). "Dodgers take to air as Nolasco grounds Cubs". mlb.com. Retrieved August 28, 2013. ↑ Gurnick, Ken (August 31, 2013). "Puig's four hits, A-Gon's two homers lead LA". mlb.com. Retrieved August 31, 2013. ↑ Gurnick, Ken (September 1, 2013). "M. Ellis' pinch-hit single inches LA closer to postseason". mlb.com. Retrieved September 1, 2013. ↑ Gurnick, Ken (September 1, 2013). "Puig backs Greinke as Dodgers sweep Padres". mlb.com. Retrieved September 1, 2013. ↑ Gurnick, Ken (September 2, 2013). "Offense comes through on Kershaw's off day". mlb.com. Retrieved September 3, 2013. ↑ Gurnick, Ken (September 4, 2013). "Puig, Hanley out, but LA still wins sixth straight". mlb.com. Retrieved September 4, 2013. ↑ Gurnick, Ken (September 5, 2013). "Volquez hit hard in losing Dodgers debut". mlb.com. Retrieved September 5, 2013. ↑ Warnemuende, Jeremy (September 7, 2013). "Shorthanded Dodgers fall in opener vs. Reds". mlb.com. Retrieved September 7, 2013. ↑ Warnemuende, Jeremy (September 7, 2013). "Frazier KO's Dodgers with walk-off single". mlb.com. Retrieved September 8, 2013. ↑ Call, Andy (September 9, 2013). "Dodgers' skid continues with another walk-off loss". mlb.com. Retrieved September 9, 2013. ↑ Laymance, Austin (September 10, 2013). "Uribe's three homers put Dodgers back on track". mlb.com. Retrieved September 10, 2013. ↑ Laymance, Austin (September 11, 2013). "Van Slyke swats Dodgers closer to NL West title". mlb.com. Retrieved September 11, 2013. ↑ Gurnick, Ken (September 12, 2013). "Ryu scuffles as LA's magic number holds at six". mlb.com. Retrieved September 12, 2013. ↑ Laymance, Austin (September 13, 2013). "A-Gon's walk-off single topples Giants in 10th". mlb.com. Retrieved September 13, 2013. ↑ Laymance, Austin (September 14, 2013). "Kershaw loses, but Dodgers inch closer to clinch". mlb.com. Retrieved September 14, 2013. ↑ Laymance, Austin (September 15, 2013). "Dodgers on wrong side of history vs. Giants". mlb.com. Retrieved September 15, 2013. ↑ Laymance, Austin (September 15, 2013). "Dodgers' title hunt stalled by Giants". mlb.com. Retrieved September 15, 2013. ↑ Gurnick, Ken (September 17, 2013). "Scuffling Dodgers drop fourth straight". mlb.com. Retrieved September 17, 2013. ↑ Gurnick, Ken (September 18, 2013). "Dodgers tee up clincher by bashing D-backs". mlb.com. Retrieved September 18, 2013. ↑ Gurnick, Ken (September 19, 2013). "LA's first win-and-in shot is stuffed in Arizona". mlb.com. Retrieved September 19, 2013. ↑ Gurnick, Ken (September 19, 2013). "Dodgers power their way to NL West crown". mlb.com. Retrieved September 19, 2013. ↑ Gurnick, Ken (September 21, 2013). "Dodgers rest regulars night after clincher". mlb.com. Retrieved September 21, 2013. ↑ Gurnick, Ken (September 22, 2013). 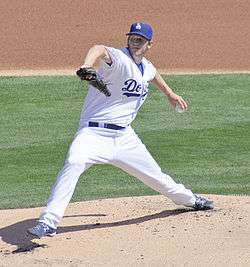 "Kershaw cruises to 15th win in San Diego". mlb.com. Retrieved September 22, 2013. ↑ Gurnick, Ken (September 22, 2013). "Greinke dominates Padres in playoff tuneup". mlb.com. Retrieved September 22, 2013. ↑ Gurnick, Ken (September 25, 2013). "Pair of long homers power Ryu, Dodgers". mlb.com. Retrieved September 25, 2013. ↑ Gurnick, Ken (September 26, 2013). "Nolasco's woes continue in last start before playoffs". mlb.com. Retrieved September 26, 2013. ↑ Gurnick, Ken (September 27, 2013). "Dodgers' early lead doesn't hold up against Giants". mlb.com. Retrieved September 27, 2013. ↑ Laymance, Austin (September 28, 2013). "Kershaw's ERA to 1.83 with gem in final start". mlb.com. Retrieved September 28, 2013. ↑ Laymance, Austin (September 29, 2013). "Greinke sharp in final tuneup for postseason". mlb.com. Retrieved September 28, 2013. ↑ Laymance, Austin (September 29, 2013). "Dodgers' focus on October in season finale". mlb.com. Retrieved September 29, 2013. ↑ Dilbeck, Steve (September 29, 2013). "Dodgers lose Matt Kemp for entire postseason with ankle injury". LA Times. Retrieved October 1, 2013. ↑ Shaikin, Bill (October 1, 2013). "Dodgers' Andre Ethier probably limited to pinch-hitting in NLDS". LA Times. Retrieved October 1, 2013. ↑ Stephen, Eric (October 3, 2013). "Dodgers 6, Braves 1: Clayton Kershaw strikes out 12 in Game 1 win". truebluela.com. Retrieved October 3, 2013. ↑ Gurnick, Ken (October 4, 2013). "Offense subdued as Dodgers fall into NLDS tie". mlb.com. Retrieved October 4, 2013. ↑ Gurnick, Ken (October 7, 2013). 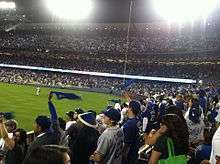 "Dodgers take control with Game 3 rout of Braves". mlb.com. Retrieved October 7, 2013. ↑ Gurnick, Ken (October 8, 2013). "Juan and done: Uribe powers Dodgers to NLCS". mlb.com. Retrieved October 8, 2013. ↑ Gurnick, Ken (October 12, 2013). "Dodgers squander chances, drop Game 1 in 13th". mlb.com. Retrieved October 12, 2013. ↑ Gurnick, Ken (October 12, 2013). "Dodgers' bats neutralized behind Kershaw in duel". mlb.com. Retrieved October 12, 2013. ↑ Gurnick, Ken (October 14, 2013). "Dodgers back superb Ryu in Game 3 victory". mlb.com. Retrieved October 14, 2013. ↑ Gurnick, Ken (October 15, 2013). "Dodgers' backs against wall after Game 4 loss". mlb.com. Retrieved October 15, 2013. ↑ Gurnick, Ken (October 16, 2013). "Homers, Greinke help Dodgers extend NLCS". mlb.com. Retrieved October 16, 2013. ↑ Gurnick, Ken (October 18, 2013). "No Hollywood ending for Kershaw, Dodgers". mlb.com. Retrieved October 18, 2013. ↑ Stephen, Eric (November 6, 2013). "Zack Greinke wins 2013 Silver Slugger". truebluela.com. Retrieved November 6, 2013. ↑ Meisel, Zack (August 5, 2013). "Kershaw wins July Pitcher of the Month honors". mlb.com. ↑ Simon, Andrew (July 3, 2013). "Puig nabs NL Player, Rookie awards for June". mlb.com. ↑ Stephen, Eric (September 4, 2013). "Zack Greinke wins NL Pitcher of the Month for August". truebluela.com. ↑ Stephen, Eric (June 10, 2013). "Yasiel Puig wins NL Player of the Week". truebluela.com. ↑ Harding, Thomas (September 5, 2013). "Philanthropic Kershaw honored with Rickey Award". mlb.com. ↑ "G2013 Warren Spahn Award Winner – Clayton Kershaw". Jim Thorpe Association. October 11, 2013. Retrieved October 11, 2013. ↑ Eddy, Matt (October 28, 2013). "2013 All-Rookie Team: Puig, Fernandez Lead An Impressive Group". Baseball America. Retrieved October 29, 2013. ↑ Laymance, Austin (April 6, 2013). "Dodgers trade Harang to Rox for Hernandez". Losangeles.dodgers.mlb.com. ↑ Gurnick, Ken (April 9, 2013). "Federowicz demoted to Triple-A Albuquerque". Losangeles.dodgers.mlb.com. ↑ Network, Sports (April 10, 2013). "Dodgers activate Billingsley from DL". miamiherald.com. ↑ Emerick, Tyler (April 12, 2013). "Greinke to miss eight weeks following surgery". dodgers.com. ↑ Gurnick, Ken (April 15, 2013). "Tolleson lands on DL; Wall called up to join bullpen". dodgers.com. ↑ Simon, Andrew (April 17, 2013). "Dodgers place Capuano on DL, recall Federowicz". dodgers.com. ↑ Weisman, Jon (April 21, 2013). "Billingsley heads to disabled list, Fife recalled". dodgerthoughts.com. ↑ Gurnick, Ken (April 25, 2013). "With Lilly back, Federowicz sent to Minors". dodgers.com. ↑ Roberts, Quinn (April 27, 2013). "Peralta looks to keep the heat on Dodgers". dodgers.com. ↑ Laymance, Austin (April 29, 2013). "Hanley returns as Kershaw goes on bereavement list". dodgers.com. ↑ Gurnick and Austin Laymance, Ken (April 30, 2013). "Dodgers recall Guerra, option Wall to Triple-A". dodgers.com. ↑ Gurnick, Ken (May 3, 2013). "Lilly goes on DL after trying to pitch through injury". dodgers.com. ↑ Gurnick, Ken (May 4, 2013). "Hanley to DL with hamstring strain; Gordon recalled". dodgers.com. ↑ Laymance, Austin (May 6, 2013). "Second baseman Ellis latest Dodger to land on DL". dodgers.com. ↑ Laymance, Austin (May 7, 2013). "With Hairston on DL, Herrera called up from Triple-A". dodgers.com. ↑ Laymance, Austin (May 9, 2013). "Federowicz recalled as Dodgers option Sellers". dodgers.com. ↑ Laymance, Austin (May 10, 2013). "Van Slyke called up; Herrera optioned". dodgers.com. ↑ Laymance, Austin (May 15, 2013). "Dodgers activate Greinke, place Beckett on DL". dodgers.com. ↑ Gurnick, Ken (May 19, 2013). "Dodgers activate infielder Ellis from DL". dodgers.com. ↑ Gurnick, Ken (May 20, 2013). "Lilly activated, Magill sent back to Triple-A". dodgers.com. ↑ Gurnick, Ken (May 27, 2013). "Gordon sent down as Hanley nears return". dodgers.com. ↑ Laymance, Austin (May 30, 2013). "Hamstring strain sends Kemp to 15-day DL". dodgers.com. ↑ Gurnick, Ken (May 31, 2013). "Dodgers add Moylan to 'pen, option Guerra". dodgers.com. ↑ Gurnick, Ken (June 2, 2013). "Dodgers scratch Ryu, call up Magill; A.J. Ellis to DL". dodgers.com. ↑ Gurnick, Ken (June 2, 2013). "Needing outfield help, Dodgers hope Puig is spark". dodgers.com. ↑ Laymance, Austin (June 3, 2013). "Dodgers call up Fife to make spot start for Capuano". dodgers.com. ↑ Gurnick, Ken and Austin Laymance (June 4, 2013). 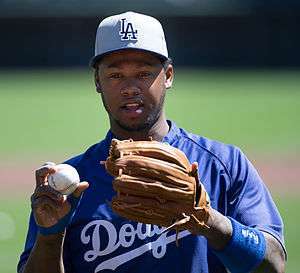 "Hanley returns to Dodgers, who place Capuano on DL". dodgers.com. ↑ Berry, Adam (June 9, 2013). "Neck issue forces Lilly to DL; Magill recalled". dodgers.com. ↑ Gurnick, Ken and Austin Laymance (June 10, 2013). "Dodgers recall Sellers to shore up bench". dodgers.com. ↑ Laymance, Austin (June 11, 2013). "Van Slyke to DL as Withrow, Castellanos called up". dodgers.com. ↑ Petrella, Steven (June 14, 2013). "Dodgers activate catcher Ellis prior to opener". dodgers.com. ↑ Fogle, Max (June 15, 2013). "Dodgers Claim John Baker". mlbtraderumors.com. ↑ "Dodgers reinstate Chris Capuano from the disabled list; option Alex Castellanos to Triple-A". dodgers.com. June 19, 2013. ↑ Gurnick, Ken (June 20, 2013). "Dodgers recall Herrera from Triple-A, option Withrow". dodgers.com. ↑ Laymance, Austin (June 25, 2013). "Kemp gets green light, comes off disabled list". dodgers.com. ↑ Gurnick, Ken and Austin Laymance (June 28, 2013). "Dodgers get Van Slyke back, designate Cruz". dodgers.com. ↑ Laymance, Austin (June 29, 2013). "Hard-throwing Dominguez called up to bolster bullpen". dodgers.com. ↑ Laymance, Austin (June 30, 2013). "Dodgers call up Withrow, designate Guerrier". dodgers.com. ↑ Levine, Bruce. "Carlos Marmol dealt to Dodgers". ESPN.com. Retrieved July 2, 2012. ↑ Gurnick, Ken (July 4, 2013). "Marmol accepts Minor League assignment". mlb.com. ↑ Gurnick, Ken (July 5, 2013). "Crawford comes off DL, enters outfield platoon". mlb.com. ↑ Gurnick, Ken (July 6, 2013). "Dodgers get Nolasco for three Minor Leaguers". mlb.com. ↑ Gurnick, Ken (July 8, 2013). "Kemp, Fife headed to 15-day disabled list". mlb.com. ↑ Simon, Andrew (July 21, 2013). "Kemp delivers in return from DL, exits with injury". mlb.com. ↑ Gurnick, Ken (July 23, 2013). "Dodgers summon Marmol, put Dominguez on DL". mlb.com. ↑ Gurnick, Ken (July 24, 2013). "Kemp lands on DL for third time this season". mlb.com. ↑ "Dodgers designate Ted Lilly for assignment, recall Elian Herrera". Dodgers Press Release. July 25, 2013. Retrieved July 25, 2013. ↑ Gurnick, Ken (July 30, 2013). "Former All-Star Wilson signs with Dodgers". Retrieved July 30, 2013. ↑ Gurnick, Ken (July 31, 2013). "Dodgers trade for Butera, bolster catching depth". mlb.com. ↑ "Dodgers recall Scott Van Slyke; option Elian Herrera to Triple-A Albuquerque". Dodgers Press Release. July 31, 2013. Retrieved July 31, 2013. ↑ Gurnick, Ken (August 1, 2013). "Mattingly on Kersh: 'It's hard to say anybody's better'". Retrieved August 2, 2013. ↑ Gurnick, Ken (August 4, 2013). "Fife returns from DL to face Cubs in finale". Retrieved August 4, 2013. ↑ "Dodgers recall Dee Gordon, option Stephen Fife to Triple-A Albuquerque". August 5, 2013. ↑ "Dodgers Outright John Baker To Triple-A". August 7, 2013. ↑ "Transactions". August 13, 2013. ↑ "Transactions". August 16, 2013. ↑ Gurnick, Ken (August 19, 2013). "Beard is back: Wilson joins Dodgers' bullpen". ↑ Gurnick, Ken (August 30, 2013). "Dodgers sign free agent Volquez for rotation depth". ↑ Laymance, Austin (September 1, 2013). "Dodgers acquire M. Young from Phillies". mlb.com. ↑ Stephen, Eric (September 1, 2013). "Scott Van Slyke, Stephen Fife among 5 Dodgers recalled from Triple-A Albuquerque". truebluela.com. ↑ "Dodgers Recall Chris Withrow From Triple-A Albuquerque". cbslosangeles.com. September 3, 2013. ↑ "Dodgers select contract of Onelki Garcia". mlb.com. September 11, 2013. ↑ Stephen, Eric (September 14, 2013). "Alex Castellanos, Nick Buss added to Dodgers roster". trueblue.com. ↑ Gurnick, Ken (September 16, 2013). "Kemp K's to end game in first at-bat off DL". mlb.com. ↑ Stephen, Eric (October 17, 2013). "Dodgers claim Mike Baxter off waivers from Mets, DFA Alex Castellanos". truebluela.com. Retrieved October 17, 2013. ↑ Pacific Coast League (June 26, 2013). "2013 Futures Game: United States Roster". baseballamerica.com. ↑ Lindskog (June 7, 2013). "2013 Pacific Coast League All-Stars Announced". milb.com. ↑ Stephen, Eric (July 2, 2013). "Joc Pederson, Zach Lee lead Chattanooga contingent on Southern League All-Star team". truebluela.com. ↑ Lindskog, Mike (June 7, 2013). "Mount, Cuevas to Represent Quakes at All-Star Game". milb.com. ↑ MiLB.com Staff (June 5, 2013). "MWL unveils All-Star Game rosters". milb.com. ↑ Albuquerque Isotopes (August 26, 2013). "Buss Named to 2013 All-PCL Team". milb.com. Retrieved August 29, 2013. ↑ Dykstra, Sam (August 30, 2013). "Baez, Smokies dominate SL All-Stars". milb.com. Retrieved August 31, 2013. ↑ Lindskog, Mike (August 23, 2013). "Schebler Named to Post-Season All-Star Team". milb.com. Retrieved August 29, 2013. ↑ Marinis, Dan (August 23, 2013). "Buxton earns spot among MWL stars". milb.com. Retrieved August 31, 2013. ↑ Dykstra, Sam (September 1, 2013). "MVP Ratterree heads Pioneer All-Stars". milb.com. Retrieved September 1, 2013. ↑ Dilbeck, Steve (September 27, 2013). "Dodgers name Zach Lee, Scott Schebler as top minor leaguers". latimes.com. ↑ Lindskog, Mike (September 1, 2013). "Quakes Win in Ten, Qualify for Playoffs!". milb.com. Retrieved September 2, 2013. ↑ Lindskog, Mike (September 7, 2013). "Quakes' Season Ends with Heart-Breaking Ninth". milb.com. Retrieved September 7, 2013. ↑ Livingston, Steve (August 29, 2013). "Great Lakes Secures Playoff Berth". milb.com. Retrieved August 31, 2013. ↑ Golder, Brad (September 6, 2013). "Loons Season Ends with 5-1 Loss". milb.com. Retrieved September 5, 2013. ↑ Lennox, Brandon (September 2, 2013). "Dodgers 9/1/13 minor league report – Dodgers lose to Giants in Arizona League Championship". truebluela.com. Retrieved September 2, 2013. ↑ Laymance, Austin and Ken Gurnick (August 28, 2013). "Seager headlines LA prospects in Arizona Fall League". mlb.com. Retrieved October 28, 2013. ↑ Hoornstra, J.P. (September 17, 2013). 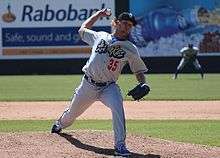 "Dodgers add four pitchers to Arizona Fall League roster.". LA Daily News. Retrieved October 28, 2013. ↑ Mayo, Jonathan (October 28, 2013). "Fall Stars Game to feature assortment of top talent". mlb.com. Retrieved October 28, 2013.